I seem to have recently and quite suddenly hit a realisation that I need to do more of what makes me happy. Life is so short and only being young once means that this is the time of your life to really seize those moments and turn dreams or goals into a reality. And these thoughts actually come from a lunch date that I had with my best friend at the weekend. Over the past month or so, I seem to have got myself into a bit of a rut. So having a really good chat with someone that I trust really made me open up and make myself realise how I am actually feeling about what is happening now, and what I want to be happening in my future. For me, I absolutely love to travel and this is what I definitely want to do more of over the next few years. Whether that be with my partner, best friend or a member of family. There's something about it that gives me that sense of freedom and adventure which I want more of. So I wanted to really inspire myself to stick to my goals so I have done the research and picked out the places that as of right now, I would like to visit before I'm 25. And if you've got that sense of adventure as well, hopefully this will inspire you too! Barcelona has got to be at the very top of my list of places to visit. When I was browsing through all of the imagery online, I was completely taken aback and all I could think of was that I must go and sooner rather than later! The colours that are shown in the images are incredible and so picturesque, it really looks like somewhere you simply have to go. 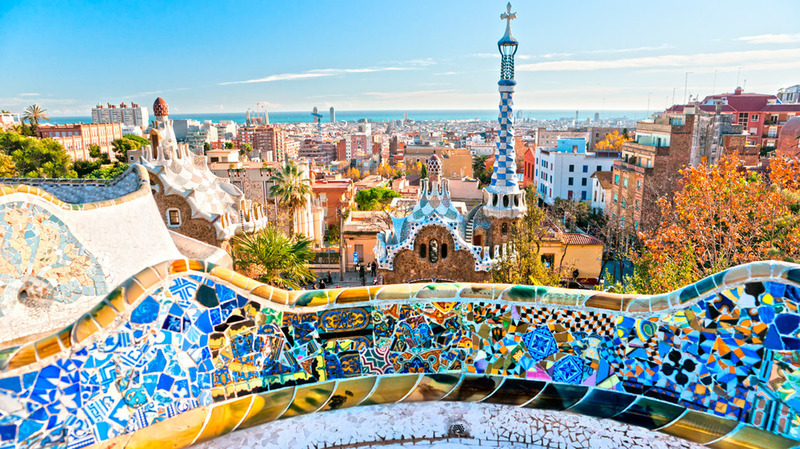 It looks like the buildings are quite Gothic which would be so interesting to see, and I would especially have to visit Park Güell which looks and sounds like nothing short of amazing. The hustle and bustle of La Rambla also sounds really exciting and is another place I will also definitely pay a visit to. Budapest is one of those places that I've heard everyone talk about because they've gone or someone that they know has gone, which makes me want to see what all the fuss is about! It looks like there are some seriously beautiful buildings to be seen, which also look like they would be stunning when they're lit up at night. I'm also seeing a lot of spas pop up, so this could definitely be one of those more relaxing city breaks away. Another city that looks like it has some gorgeous buildings to explore and take millions of photos of. The old buildings and the streets look so picturesque, I am just dying to walk around them. The Old Town Square which is what this photo is of definitely looks like my ideal city break with lots of people, shops and food. Prague's night life also sounds like that would be a bit of fun as well, so this could be a trip that I'd take with my bestie. I would absolutely love to take a trip to Madrid. It has some really beautiful parks that look super relaxing to wander around, which are also a little different to what you usually see in the busy cities. But it also looks like there are lots of shops and markets to enjoy as well. I'm also reading a lot about their churros, so that's another something to try. Zurich looks like a lovely place for a short weekend break with lakes, rivers, mountains, buildings and shops to look at. Their zoo is one of the top places to visit, which sounds pretty good. I've only ever been to the zoo once in England, so it would be interesting to see what one is like abroad.